Not content with ruining any semblance of enjoyment to be gained from Christmas Day, Easter, the Superbowl, Independence Day amongst others, I have now moved on to destroying Valentines Day, that time of year when you purchase pointless items through sheer obligation to prove your affection, when you could have done something thoughtful any other time of the year. but didn’t. Much like Mothers Day. People must think I’m jaded and twisted. Those of you who know me better understand the reality to be much, much worse. Anyway, I found this cool website (written by two English people… bitter cynical viewpoints? 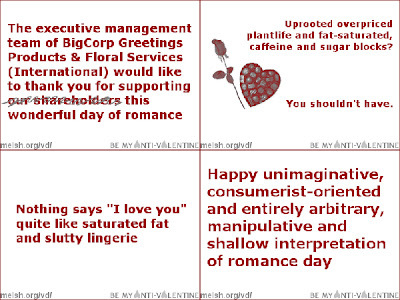 Surely not…) where there are bunch of Anti-Valentine Cards, some of which I posted above. It sums up better than I can my true feelings regarding this consumerist pothole.